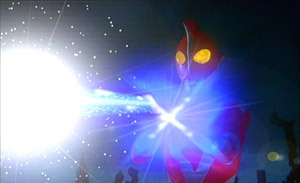 This sequel to the 30th Anniversary celebratory Ultraman farce, Ultraman Zearth, is much less of a spoof, though it still milks the premise for humour. With some great-looking SFX and a theme that involves finding strength through inner certainty, its 66-minute running time provides sometimes compelling, generally wholesome entertainment, with less overacting (the worst offenders from the first film being effectively sidelined from the beginning) and some decent martial-arts battles. 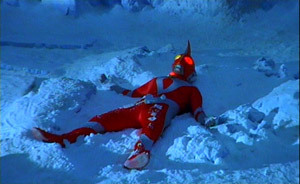 Ultraman Zearth 2 rockets into action with the titular hero getting pummelled by a mysterious "Shadow Zearth", flattened by the latter's Ultra-Fist Strike (picture) and left to die in the Arctic wastes (picture). 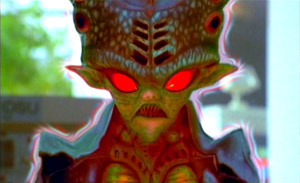 This time the Evil Character in the black car is Lady Benzen, with a femme fatale human form and an equally fatale fem-alien form lurking behind the facade (picture sequence). 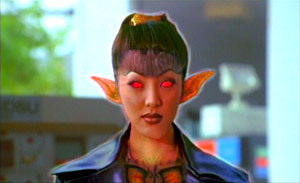 Though her motives are shadowy, one thing is clear: she aims to destroy Zearth and take over the world. To this end, she utilises the powerful Shadow Zearth first to discredit our hero and make him doubt himself; and then to destroy him utterly. 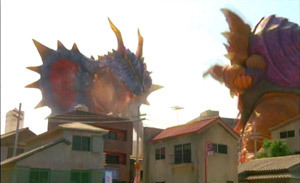 Initially the kaiju-destruction action rests on the shoulders of Shadow Zearth (picture), but both Zearth and his nemesis eventually produce "capsule monsters" that duke it out across the suburbs (picture). Meanwhile Zearth's human form, Katsuko, struggles with self-doubt and a severe crisis of confidence. 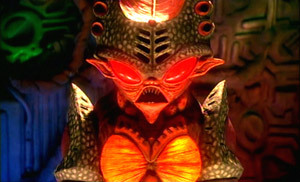 which leads him to undertake some training, urged on by his MYDO love and a disillusioned kid, to regain his lost power. All of which leads to a final series of inspirational confrontations and an ending that makes elegant reference to the beginning (picture). The humour, less-slapstick this time around, comes from the hero, Katsuko, from the reactions of human bystanders (including a man who abuses Shadow Zearth until realising the untenable nature of his position and a woman still failing to get her picture of MYDO's take-off, in a nice re-working of that motif from the first film) and from one of the new MYDO crew members -- a computer whizz who has his laptop attached to himself like some sort of prosthetic appendage. 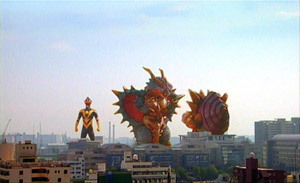 Generally, however, Ultraman Zearth 2's in-built absurdity is kept under better control than in the previous, allowing the viewer to succumb to involvment a little more often and offering a more structured scenario. 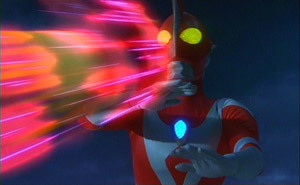 The film is colourful, energetic and inspirational -- what more could we want of Ultraman?